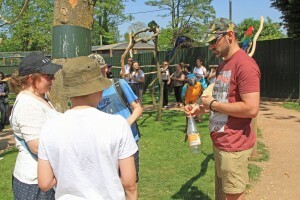 Every year, Tropical Birdland hosts the Parrot Society for one of its away days. Members are granted reduced price entry to this amazing bird park. With a variety of aviaries set in Leicestershire woodland, its main attraction is an open area where a large number of a wide variety of parrot species will allow up close and personal contact with members of the visiting public, and some remarkable photo opportunities.